Learn why Lutheran Westland is an outstanding choice for high school! 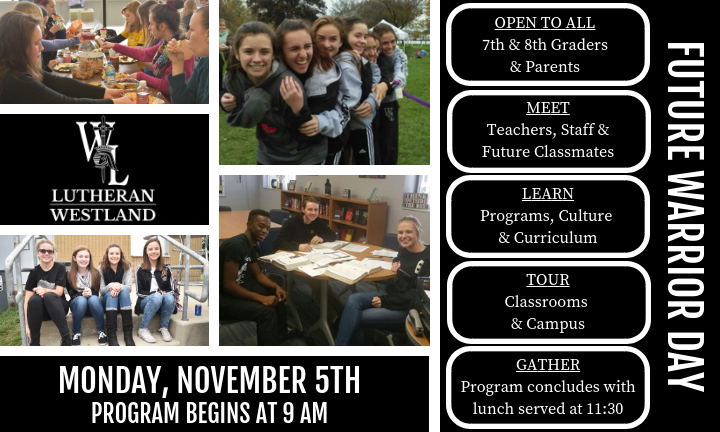 Future Warrior Day is the perfect opportunity for 7th & 8th graders to meet our faculty, staff and student council here at Lutheran Westland, tour the school, and learn what it means to be a Warrior! Devotions, fun break-out sessions, and a free pizza lunch are included. Parents are welcome to attend as well. We’ll have an information session just for you! If you are not attending with a school group, please register in advance by emailing our Admissions Director at hwenzelburger@lhsa.com or calling 734-422-2090.